“ Calling All Cars ! Suddenly, the TV cameras would reveal black and white 1956 Fords, screeching their tires and the flashing red light – “the cherry on top” – would come alive and black and white 1957 Plymouth Fury “squad cars” would rocket off a side road slinging gravel and clouds of dust as the vehicles screamed on to the main highway with their silver sirens on the front fender singing the banshee wail of justice in pursuit of the bad guys. By the end of “M Squad” or “Highway Patrol” both television lawmen always had the bad guy in custody because the “nationwide dragnet” always worked. 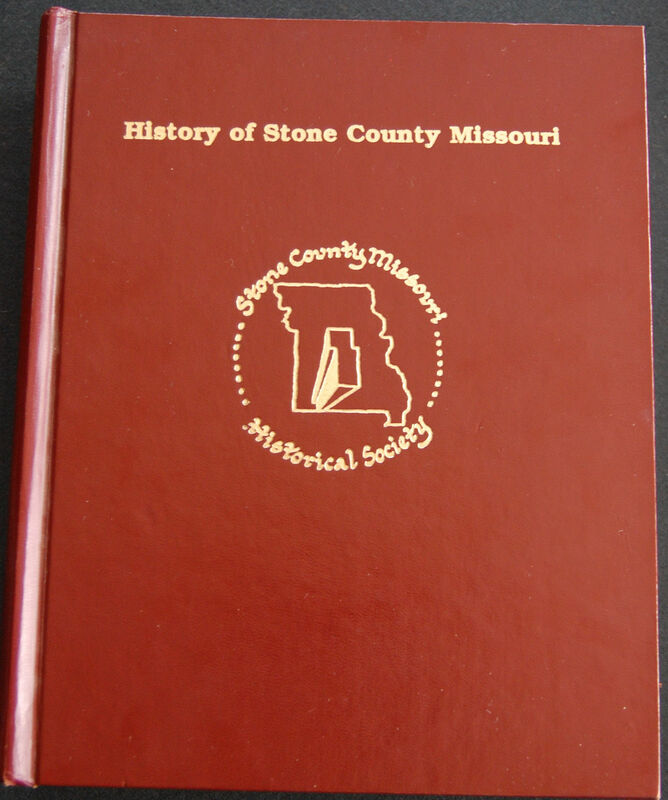 Yes, The Stone County Historical and Genealogical Society is burning the midnight oil to turn out the citizens of the county and The Show-Me State to celebrate the Missouri Mule devotion of this rural southwest Missouri county’s existence and progress in the continuing saga of the Ozarks and the United States of America. The itinerary of the day’s events is coming together for the organizations, floats, booths, and concessions. Vendors and people are getting together for the celebration. Stone County Military Veterans are signing up for the parade, but some of Stone County’s military veteran daughters still need to call and sign up. Stone County’s 90 year old citizens and older have also signed up to be in the celebration. The society would like to be able to allow these older Stone County citizens to relax in the back seat of a convertible and leisurely ride along the parade route smiling and waving at their fellow citizens. Face it, Americans, waking up each morning to meet the day’s challenges and living each day to the age of 90 or older is a major accomplishment.
" Calling All Cars ! Calling All Cars !" 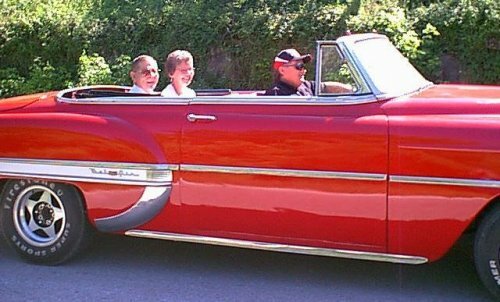 Jim Eutsler sits behind the wheel of the vintage 1954 Chevrolet Bel Air. Eutsler drives Grand Marshals Willis and Mary Langley Wolf along the parade route for Stone County's 150th Anniversary Celebration, June 2, 2001, in Galena, Missouri. Gearing up for Stone County's 160th Anniversary in Galena, September 24, The Stone County Historical and Genealogical Society is looking for volunteer chauffeurs with classic convertible cars, who would be willing to chauffeur Stone County's 90 year old and older citizens, For more information call 417-357-6317. Vendors should call 417-357- 0112. Photo by Junior Warren, Galena, MO. It would be nice and appreciated if people, who own classic, vintage, antique, and American muscle cars would contact the society and offer to chauffeur these citizens along the parade route. The society may not have the Macy’s Thanksgiving Day Parade organized for Stone County, Missouri, yet, but they are going at the organization of the event with all the enthusiasm and initiative of people planning the annual New York City New Year’s Eve Times Square Celebration. If you happen to own a classic automobile, especially a convertible, and would be willing to help out – it would be appreciated. Please, call 417-357-6173. I’m honored that I could provide the inspiration to encourage you to begin a blog. I love the clean design of your webpage. I scanned the article on arbitration. It reminded me of a documentary that pointed out that the Bush Administration worked against Americans having the right to arbitrate differences against businesses. I can’t promise to inspire you with legal issues, but I am a retired reporter- which means I know longer get paid to write and shoot photos. Still, with the reporter’s heart. I follow the photo opportunity. Thus, you might appreciate the photos and story I posted “She Male Pass In Review” on my blog. Your firm may not handle gender issues, but I was in college when American feminists were pushing hard to get passage of the Equal Rights Amendment because they didn’t believe the Fourteenth Amendment protected their rights under the United States Constitution. Thanks again for your compliment. I appreciate knowing I provided inspiration. Thank you. Thank you for taking the time to comment. It is said that over time all writers develop their own style, which is why young writers who have tried to copy “Papa” Hemingway’s simple sentence structure style have never been able to pull it off. I would hope that my writing style delivers the message clearly. I just want to tell you that I’m very new to blogging and absolutely enjoyed you’re web blog. Almost certainly I’m want to bookmark your site . You definitely come with remarkable well written articles. Bless you for sharing with us your webpage. Thank you for the compliment and the bookmark. Medical emergencies don’t make appointments. In the US, there are HMOs, medical plans and medical insurance. In the US that medical insurance planning has been welded into the culture. Asia at large, doesn’t seem to have this philosophy yet. Back in the 1990s, when I was in Japan, they were “examing” the approach. To my knowledge, medical emergencies in Asia are a “Cash” operation. In the Philippines, there is discussion about the medical insurance and plans, but, if you need immediate medical care = pray you have the pesoes in your wallet. No Money – No Medical. While you may find an HMO, Medical Plan or Medical Insurance provider to cover a tourist to Europe, Canada, Australia or the United States — be careful of those companies that “claim” to handle medical claims with countries in Asia. Americans should check out Embassy, Consulate and Department Of State websites on medical information and probably give a quick search to the Better Business Bureau before signing up with an “Overseas Medical Provider.” Other global citizens should check with their Embassies and Consulates about medical policies for Overseas travelers. *I am often to blogging and i truly appreciate your content. The article has actually peaks my interest. I am going to bookmark your website and keep checking for new information. I appreciate the feedback. I hope you will continue to visit my blog often. Thank you. I’m drawn to antique cars like a moth to a flame. There was a time, it seems. when automobile manufactures were creative, visionary and had a sense of imagination in motion. In the 21st Century, it seems automobile manufacturers pick up a pebble, add a front and back windshield and four wheels and fit into the lackluster “conform to the norm” of boring car design. I Will have to return again whenever my course load lets up – however I am taking your Feed so i could go through your web blog offline. Cheers. Thank you for the compliment. Best of luck on your course load. Weird , your post turns up with a black hue to it, what color is the primary color on your webpage? My template is a white background. The type is black. Basically, it is a white and black template like a sheet of electronic bond paper with words on it. I stick to the basics in layout, when it comes to displaying writing. You might want to check your browser options for how it displays this blog. While I really like this post, I believe there was an punctuational error near to the end from the third section. Thank you for the compliment. There maybe a punctuation error in the text. As a young journalist, I had to memorize the immortal grammar and punctuation commandments of “Strunk and White.” In the 21st Century, people use their cell phone and jargon like LOL, IMHO,and other abbreviations. The English Language “ain’t” what it once was. Ernest “Papa” Hemingway had a writing style that no writers have been able to absorb as well as he. He used simple sentences. It was his style and his message got across. British Prime Minister Winston Churchill was sometimes criticized by the English aristocracy and American English teachers for ending his sentences with prepositions. It was his style and his message got across. Like Hemingway and Churchill, I am writing and speaking to my readers and listeners. I pay attention to spelling. However, I use the spelling of magick, when I am writing about supernatural or paranormal events that do not relate to the scientific “illusions” of stage magicians. As far as grammar and punctuation, what the professors forget to explain to students is “As Life Evolves Language Evolves.” The Supreme Benefit of English is the language’s ability to evolve. When necessary English absorbs French, Iraqi, Filipino and other languages words and in a couple of generations Americans, Australians, Canadians, Irish,and the Brit, usually just think the word has always been an English word. Latin didn’t evolve and now it is a “Dead Language” used only by scholars, in religious mass and on fancy certificates to hang on your wall. Other early languages didn’t evolve and stay buried in the ground until an archaeologist digs up a site. You are observant to notice that I might have a punctuation error on that page, but, if my message got through — then, honestly, I don’t see it as a big deal. I’m a writer. I’m a journalist. I am not a retired English teacher, who wasted time teaching kids to “diagram sentences,” knowing they would never do it. In all the years, I have written published newspaper articles, official correspondence,and published blog articles — I have never “diagramed a sentence.” It is a waste of time English exercise. Thank you for pointing out the possible “punctuation error,” but, since I look at the text and my message seems to get through, then, it is just dust to sweep under the rug, rather, than out the door. Thank you for the compliment. I try to publish photos and articles on a somewhat regular basis. Wanted to drop a remark and let you know your Feed is not functioning today. I tried adding it to my Google reader account and got absolutely nothing. Thank you for the information. The RSS Feed is the widget supplied by Word Press, so I’m not sure why it would not work with your Google Reader account. The design for the website is a little bit off in Epiphany. Nevertheless I like your website. I might have to use a normal browser just to enjoy it. I’ve discovered there are tons of different web browsers you can use. I use Firefox 15 to do my layout. I upgrade my Firefox often. I have other browsers I use to check my blog every now and then. Opera, Chrome, Avant and Flash Peak Simple Browser to name a few, I have on my machine, displays the blog the way I do the layout. Please email me with some hints about how you made your blog site look this awesome, I would be appreciative! If you have any friends in the newspaper or magazine business, talk to them about writing, layout and design. You can pick up some wonder ideas. If you don’t have friends in the publishing business, stop by the library or a bookstore and browse their books on newspaper and magazine layout and design. I learned in the newspaper business, when you have a photo that catches your eye — “Run It Big!” You publish it as big as the grain or pixels will allow. If you have several photos on the same topic, then, consider doing a photo layout or photo feature. Newspaper editors call a two-page layout, “A Double Truck.” Magazine Editors call a two-page layout a “Centerfold.” The basic idea for a photo feature “double truck” or “centerfold” layout is “dyanmic photos that catch your eye,” then, you run the photos — BIG ! The Lead or Opening Photo should be the largest. In my blog layout, I choose my best photos and run them all BIG ! If you have extra photos, you can either keep them stored on your hard drive or you might want to consider using the smaller photos as a Photo Album on Word Press or a separate Photo Album on Picasa. One thing to always consider in publishing — “Keep It Easy On The Eyes.” Books like to use about 12 point Times Roman as a rule. I find 1 point Arial to be easy on the eyes. Don’t be afraid to use Subheads — small, short headlines inserted in the copy to break up the text and attract the eye. Line art or Clip art is artwork or photos that you can use in your copy. Whether you use artist created, drawn, sketched line art or logos, like photos, the art works as “eye candy” to bring your eye into the copy. I had not intended to give you a crash course in “Sam’s Newspaper Design and Blog Layout 101”, but, maybe these ideas will help you in your blog layout on your site. Good Luck. It’s seriously a cool and useful piece of information. I’m glad that you shared this helpful information with us. Please keep us up to date such as this. Thank you for sharing. Thank you for the compliment. If you are interested in automobiles, you might want to check out the “hot Rod” website. They have information about American Muscle and Vintage cars and usually FREE desktop wallpapers. I have a facebook page Samuel Warren. But, I don’t have a fan page. My primary focus on the Internet is publishing to my blog. Thank you for the compliment. I find American automobiles interesting up until 1980/ After 1980 automobiles worldwide seem a “Cookie cuter desgin” basic smooth river stones with four wheels and windows to get you from point A to point B. Imagination seems dead in the global automobile industry. Thank you for the compliment. I try to find intresting stories and photos to post. Great post at ” Calling All Cars ! Calling All Cars !” Sam I Am Blog. I was checking continuously this blog and I am impressed! Very useful information particularly the last part 🙂 I care for such info a lot. I was looking for this particular information for a long time. Thank you and good luck. I am always on the lookout for interesting photo and story ideas. Wow, superb blog layout! How long have you been blogging for? you made blogging look easy. The overall look of your site is magnificent, let alone the content!. Thanks For Your article about ” Calling All Cars ! Calling All Cars !” Sam I Am Blog . Thank you for the compliment. I’m been blogging since about 2003 or there about. Then, again I;ve been writing since I was eight years old. I got my first byline in the “Stone County Republican” in Crane, Missouri around 1965 or 1966. Uncle Sam gave me a paycheck and I wrote for six US Air Force newspapers. I even wrote for “The Blythe Spirit” when Uncle was giving me a paycheck to work in the 2101st Communications Squadron comm center at Blytheville. I love to write. I appreciate hearing from readers. Thank you for taking the time to comment. I loved do the Calling All Cars because automobiles and airplanes can make for great photos. I like this web site very much, Its a real nice berth to read and obtain info. “Dead battles, like dead generals, hold the military mind in their dead grip.” by Barbara Tuchman…. Thank you for the compliment. You have an interesting quote from Barbara Tuchman. Since I have a “military Mind” let me point out something she did not realize. “War is inevitable.” People have not evolved beyond the conflict stage. As long as people are in “Conflict” there will always be lawyers and legal systems. When the “Conflict” swells beyond national borders that is when War erupts. The world is full of “dead battles,” but people always find a way to start “new battles.” Dead Generals and Dead Admirals simply leave behind their positions for other men and women to step into. Before the Allies got to Germany in World War II, Adolf Hitler and his Nazis had slaughtered Jews with no remorse. Before military forces arrived in Bosnia, the Serbs and Croats were killing one another like it was some kind of weird game. I was pretty pleased to discover this web site. I need to to thank you for your time for this particularly wonderful read!! I definitely really liked every little bit of it and I have you book marked to check out new things on your site. Too many times I passed over this blog, and that was a tragedy. I’m glad I will be back! Thank you for the compliment. When you have the time, please, feel free to drop me a line and let me know the articles and the photos you like. Thank you for the “Fantastic Read” compliment. I’m an opinionated and passionate person, which I try to get across in my writing. If I get through to a reader I figure I have caused some type of emotion. I hope the RSS feeds work because I’m not “techy” about that. I just used the supplied Word Press widget.